Simply, An incredible place to be!!! Villamartin Plaza is a one of a kind! 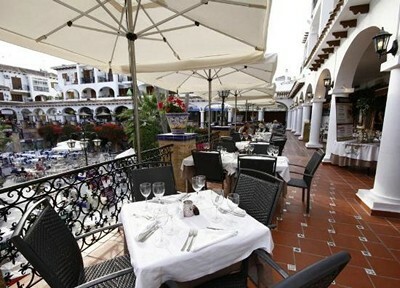 Residential homes overlook into the beautiful palm lined central area to the restaurants and bars below. There are two levels to explore set across the typical Spanish architecture. Wrought iron balconies, terracotta and ceramic tiles and stunning Spanish style lamps add to the atmosphere, which, combined with the exotic smells and sounds of laughter are always alluring. A varied and heady mix of food is available from regional delicacies to full international menus. Varieties of English, German, Argentinian, Spanish, Italian and American fare makes Villamartin Plaza the centrifuge of the area. At the Villamartin Plaza you will always find something going on. 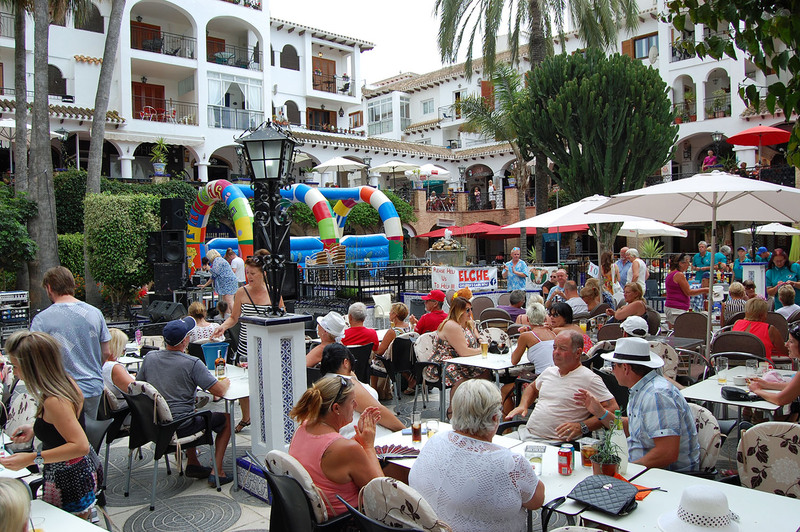 The Plaza is known not only for places to eat, have a drink or enjoy the sun, but for the nightly music entertainment in the central plaza during the summer nights. Sit and dine at your favourite restaurant, sip on a drink and listen to music and even have a dance. 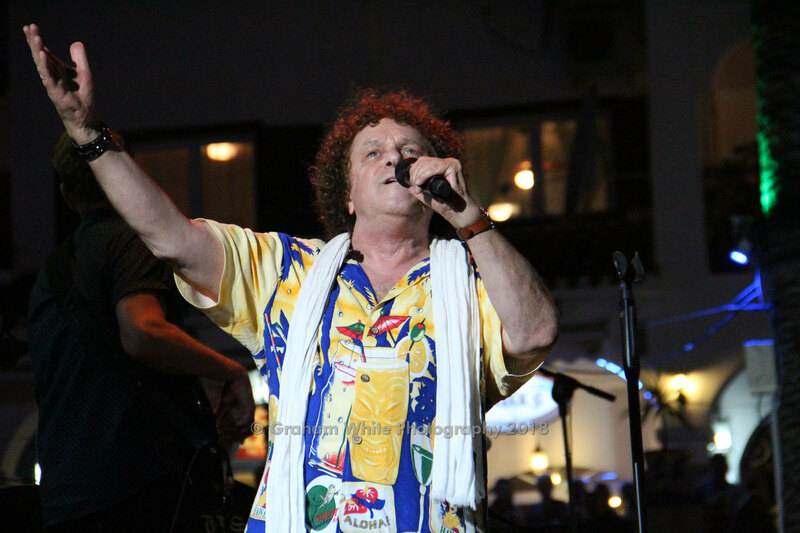 This past summer 2018 brought us an amazing array of music from all over and huge headline acts such as Paul Da Vinci’s Explosion Tour, Santiago Campillo & Buddy Whitington, Rob Falsini & Friends and the man himself LEO SAYER & BAND and many more well known acts from the UK and those local to Spain. 2019 will be the best with more huge stars, Los Pacaminos ft Paul Young, Members of the Animals, Joe Longthorne and the season finale with the one and only Les McKeown’s Bay City Rollers and many other big stars from around the world! No matter the time or day you will always find enjoyment at the Villamartin Plaza. Check out the events for 2019 in the event section. STOP THE PRESS!!!!! STOP THE PRESS!!!!! The Summer Music Festival 2019 has been decided and the list is up. 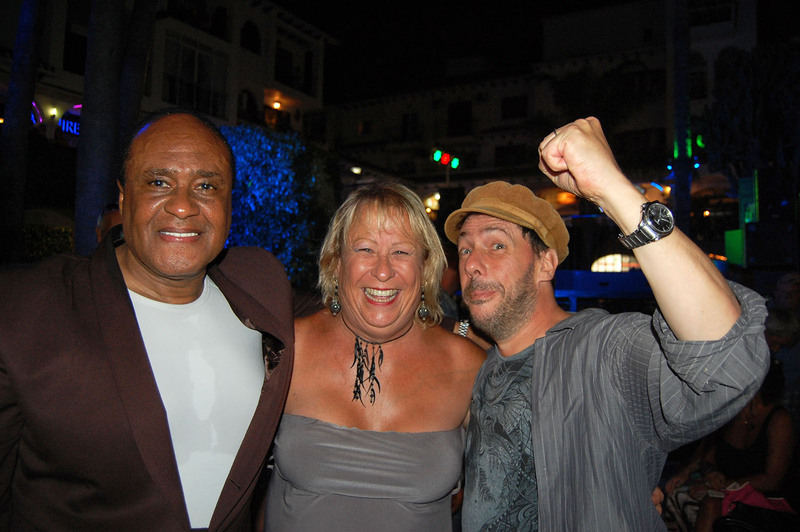 Look in the events section and make your plans now to come to the best venue for entertainment on the Costa Blanca. Please follow us on Facebook @VillamartinPlaza or here and see all of the action in the Villamartin Plaza, you won’t regret it!!! 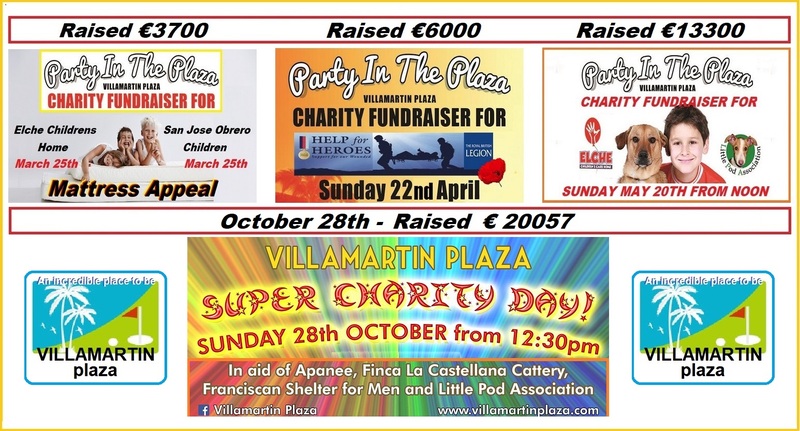 The Villamartin Plaza has become known as a main supporter of local charities such as children’s homes, local animal shelters, Men’s Homes for terminally ill and homeless and of course the British Legion / Spain. In 2016 we raised over 20,000 euros, 2017 34,000 euros and 2018 43,000 euros all going straight to the charities. Apart from the money, the charity days are immensely fun having things for kids to do both young and old! We have a great fun time with music all day and raising money. Food and drink are one of the main reasons so many visit the Villamartin Plaza with world renown restaurants and bars known to people all over the world. Some of the best food on the Costa Blanca is served up in our restaurants with top class cuisine from English fare to Spanish, German to Kebabs and Argentinian to Cafes we have it all! There are bars open all day to sit and sip a sangria with the sun tipping down on you to music venues and karaoke in the evening. No matter what you enjoy, the Villamartin Plaza will surely fill your wants. Other businesses operate from the plaza such as our local grocery store, doctor’s surgery, real estate and rental agents, hair dressers boutiques and more. 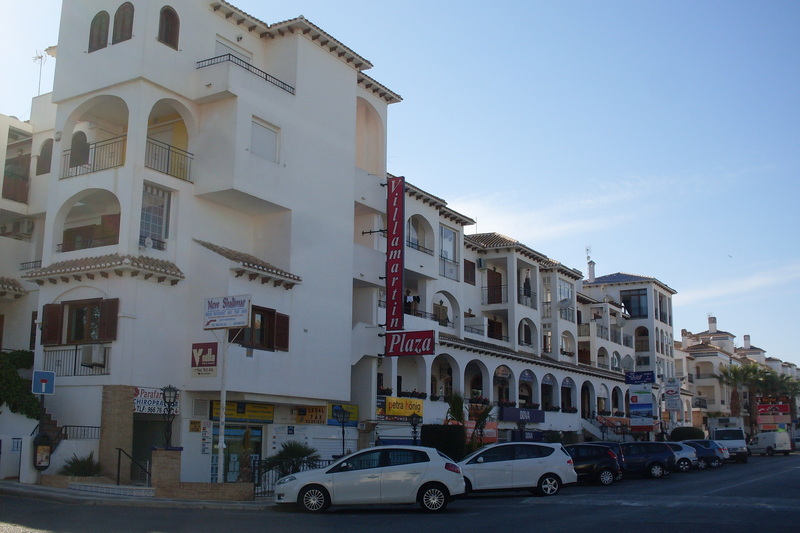 Holiday makers choose this as their central home when on holiday as Villamartin Plaza offers everything one would require on holiday. It is easy to understand why this is the most prominent holiday destination on the Costa Blanca. The Plaza with its beauty and splendor has now been recognized as a perfect setting for weddings. We had the joy in 2016 of hosting a wedding as well a blessing. 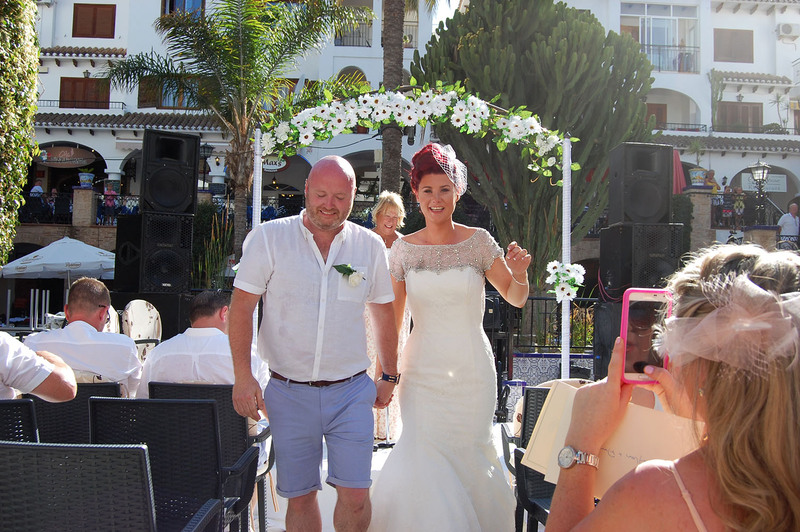 If you are thinking about having your wedding in Spain, what better place to have it, a beautiful setting, plenty of restaurants to cater, simply the best place to be, and it’s easy! So give us a call and let’s help you arrange the best wedding ever! Come and visit the Villamartin Plaza we call home, make friends, enjoy the vibrant atmosphere, dine at well know restaurants, sip cocktails as the sun sits on one of the most famous destinations in Spain. 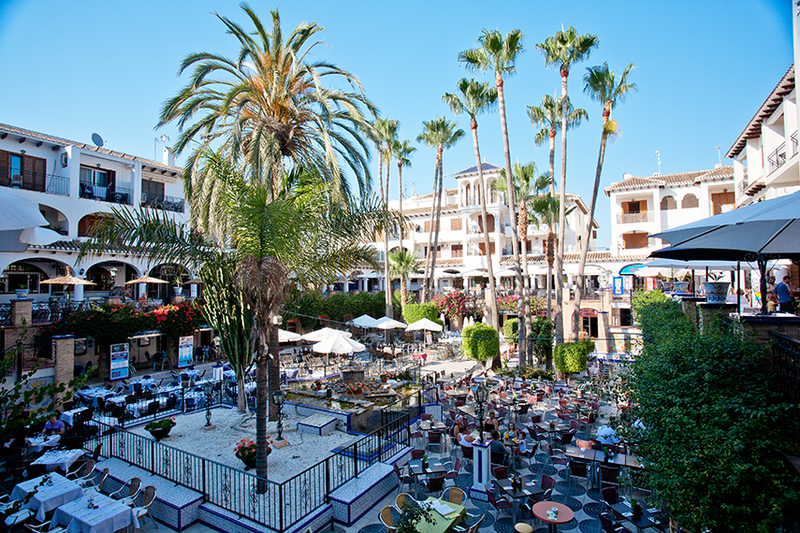 Once you have been here you will always return as most do every year, The Villamartin Plaza, simply put “An Incredible Place To Be”. Villamartin Plaza, An Incredible Place To Be!